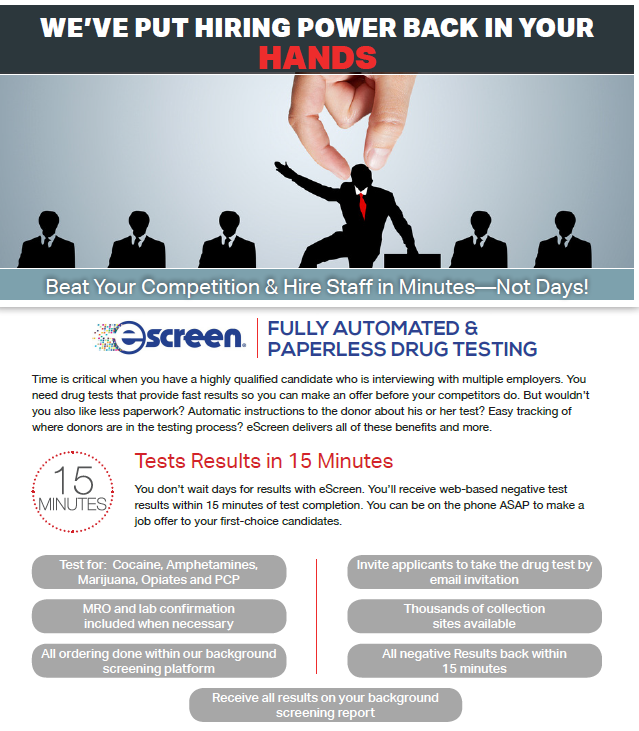 Data Disclosure Services is pleased to announce the addition of eSCREEN drug testing to its line of products! The eSCREEN drug testing service will be added to the client screening site allowing you to select this service the same as a background screening. The results will return within your screening site in your completed reports section. To assign an applicant to testing is fast and simple with an email invite process similar to the Quick App used in other screening services. Automating this testing is a huge time saver and results are returned in 15 minutes after testing is completed by the applicant. Call today to add eSCREEN to your screening program. We’ve put hiring power back in your hands.